Does The Rise Of Android’s Market Share Mean The End of Apple’s Profits? Only, here’s the thing. I HAVE been paying attention to the smartphone market. Perhaps more importantly, Horace Dediu has been too. And as his chart, above, demonstrates, the facts belie the argument that profit share follows market share. 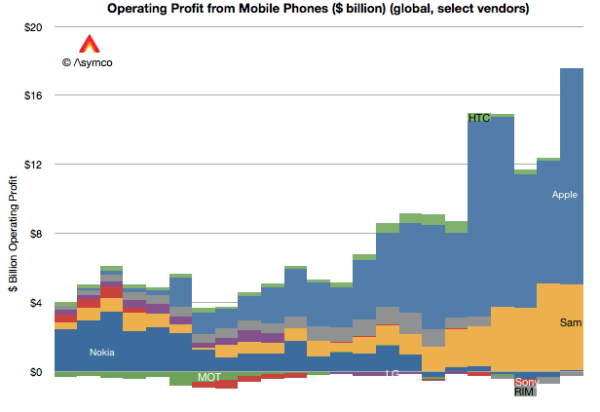 Even as Android’s market share has grown by leaps and bounds, Apple’s iPhone profit share has grown too. How can this be? Here’s what the facts are telling us. First, Android’s growth has not hurt Apple’s profit share. Instead, Android gobbled up all of the profits from the other smart phone manufacturers. Second, Samsung subsequently gobbled up all of the profits from the other Android manufacturers. Samsung now makes as much profit share as the entire mobile industry did five years ago. Third, the iPhone has not only survived the growth of Android’s market share, it has thrived, growing its profit share from 21% in 2008, to 50% in 2010, to 57% at the start of 2011, 73% at the start of 2012, and 72% at the end of 2012. And since the pool of profits has grown dramatically over the past five years, Apple’s profits have too. What will it take to get Apple’s critics to acknowledge that Apple’s iPhone strategy is actually a raging success rather than the raging failure they constantly portray it to be? Does Apple need to take in 100% of the profits in perpetuity for them to be convinced? The problem with our obsession with market share is that it rests on two faulty foundations. First, it assumes that every product sold within a category is always just as valuable as another. Second, it assumes that every customer who buys a product is of equal value. These two premises are laughably wrong. Are all smartphones or all tablets of equal quality or used in the same way? Hardly. No knowledgable person would argue that they were. Yet when we use market share as our metric, we assume exactly that. Kiddie pools and above-ground pools and in-ground pools are all considered to be “pools”. But does the sale of one necessarily impact on the sale of another? Sandals and dress shoes and winter boots are all considered to be “shoes”. But does the sale of one necessarily impact the sale of another? Similarly, when we lump all types and makes of phones or tablets together, we create a false basis of comparison. Is the iPhone or the iPad really competing with the gray market phones and tablets being sold in China anymore than in-ground pools are competing with kiddie pools or dress shoes are competing with sandals? Just because two products fall within the same category, does not necessarily mean that they are in competition with one another. The fact that customers are not of equal value is so fundamental that I shouldn’t even have to say it. There are whole industries and entire fields of learning devoted to the art of finding the right customer for the right company or product. Not only do companies target preferred customers, but they actively shun customers who are counter-productive too. Yet when we use market share as our metric, we assume that a customer is a customer is a customer. Nothing could be further from the truth. Being a bad customer is not the same thing as being a bad person. Good people can be bad customers. But being a customer is not the same thing as being a good customer either. Does Market Share Matter To Apple? Steve Jobs wanted, and Apple wants, market share. But they want the RIGHT market share. Apple wants customers who are willing to pay for their products. And Apple wants customers who are good for their platform. In other words, Apple wants market share in their target demographic. Based on the fact that Apple is taking in 72% of the mobile phone profits with only 8% or 9% of the market share, it sure sounds like they’ve aquired the right market share to me. Does the rise of Android’s market share mean the end of Apple’s profits? Hardly. You can argue as loudly as you like that developers and profit share must necessarily follow market share. But the facts will shout you down.